We've all got worksheets and word lists collecting dust in our rooms (and on our computers). This is an entire program, including a parent letter and a data sheet, in addition to the actual homework sheets. Homework that will actually make it home. Do your students ever forget to put things in their backpacks? 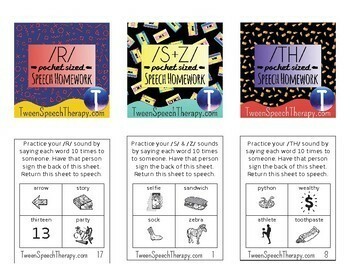 Do your older students ever ignore you in the hallway because they're embarrassed about going to speech therapy? Welcome to the schools! The struggle is real y'all. 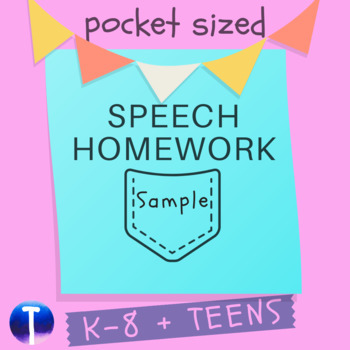 With this homework program, you can bypass the backpack by sending home pocket sized sheets. 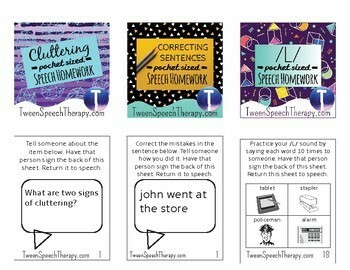 Your older students will love that their friends don't see their speech homework when they return to class. 3. Have your students put their completed homework sheets in a bucket or bag, and hold a raffle drawing (with prizes) once or twice a week, using the homework itself as the raffle ticket. No busy work here! 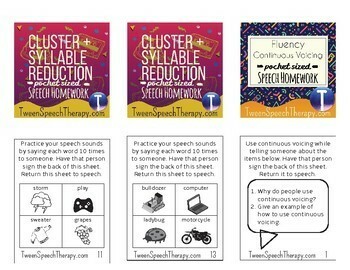 The homework sheets target speech and language skills that kids need, in a way that takes 10 minutes or less. Download a free sample and try it for yourself! Just so you know... The numbers on the homework sheets correspond to their numbers in the packets they belong to. That way, if you decide to buy the whole packet, you'll know which ones you already assigned. I wanted to point this out because you might have looked at this sample and wondered what was going on with the numbers at the bottom. Happy homeworking! Here are links to the rest of my pocket sized homework. Want to see more of my products?